NEW ORLEANS, Louisiana, USAGov't Mule and Trombone Shorty recently took the stage at the Saenger Theatre in the heart of New Orleans, where live production company Premier Production & Sound Services (PSS) provided a sound reinforcement system featuring HARMAN's JBL loudspeakers, Crown amplifiers and Soundcraft mixing consoles. PSS designed and provided the PA system for both shows, which took place on consecutive nights. The Saenger Theatre is a historic landmark that reopened in 2013 after an extended period of restoration following Hurricane Katrina. The theater now has a seating capacity of approximately 2,600 and features a balcony and VIP seating boxes on the sidewalls. The walls are slightly concave and round out to the rear, allowing for an optimal acoustic experience. PSS supplied a main PA system featuring 12 JBL VTX V25 loudspeakers per side and six ground-stacked VTX S28 subwoofers in cardioid configuration per side, powered with 36 Crown I-Tech 12000HD amplifiers. Front fills featured four VTX V20 loudspeakers, powered by a single Crown I-Tech 4x3500HD amplifier. "The acoustics of this venue coupled with the JBL loudspeakers made it very easy to get good coverage to the seating areas in the balcony and the sidewalls," said Daniel Brown, FOH Engineer for PSS. "I was pleasantly surprised with the line arrays, since a small number of these VTX boxes projected a clear and uniform image across the entire crowd. 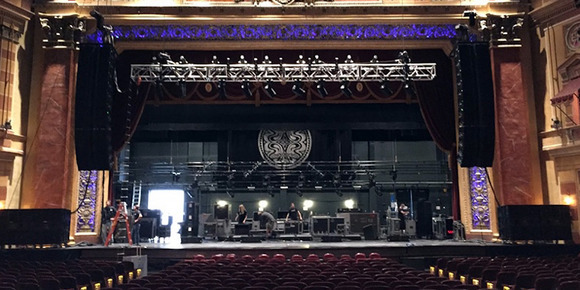 The engineer for Gov't Mule didn't even use all of the PA, and the sound was still very powerful." Trombone Shorty employed both rock and brass instruments during his performances. Combined with Gov't Mule's Southern rock styles, the emphasis was on the upper 1k to 3k frequencies. While working with the theater's excellent in-house staff, PSS adjusted the system accordingly with JBL HiQnet Performance Manager™. According to the onsite feedback, the system performed flawlessly. "There's no better way to apply settings to 36 individual amplifiers than using Performance Manager," said Brown. "We mainly use it for monitoring purposes, but we also like the presets for crossovers and limiting. It's just too easy not to use. Also, the headroom of these Crown amps gives us a lot of flexibility when tweaking the system." John Hermann, FOH Engineer for Trombone Shorty, chose to use a Vi1 (monitors) and Vi3000 (FOH) console that was integrated seamlessly with PSS Sound's PA system. Having used Vi consoles for many years, he noted that their superior ergonomics and small footprint allow for greater level of comfort and operating consistency that is hard to find anywhere else. "I like to use a lot of effects, so having multiple screens or being able to manipulate different effects processors at the same time allows me to get to different parameters at the same time," said Hermann. "When I use stereo delays, I don't have to switch pages to get to them. I also like to do most of my pan delays by hand, so having them right there on the board helps a lot." "It was a good show," Hermann concluded. "To be honest, if I was told to do an arena show tomorrow, I could do it with a Vi console without a problem."